If you've participated in the ECBC in the past, you can use the Quick Entry form to register your boat, optionally reserve a slip at Baytowne Marina and pay your deposit or entry fees. If you're a new team, use the Entry Form below. Use the Entry form to register your boat & team, optionally reserve a slip at Baytowne Marina and pay your deposit or entry fees. Use the Add Anglers form to register your anglers and mates at any time up to the start of fishing. If you want to pay the balance of your entry fee before Registration, and optionally enter the Release and/or Crew Divisions, use the Pay Balance Due form. If you want to enter the optional Release and/or Crew Divisions, or are ready to place your Jackpot bets, use the Optionals & Jackpots form. You can enter at any time up to the start of fishing. If you're new to the tournament you may have some questions about our format — what we fish for, the different entry levels and awards, and how to enter the tournament. This page should answer most of those questions. It's the most important part of every tournament. Each participant should take the time to read and understand the tournament's rules before the Captain's meeting on registration day. The tournament is June 19-23. You can come down to Baytowne Marina at Sandestin at any time to see the boats arrive and depart. Weigh-Ins are Friday (6/21) and Saturday (6/22) starting at 4:00pm — most of the fish are weighed on Saturday. 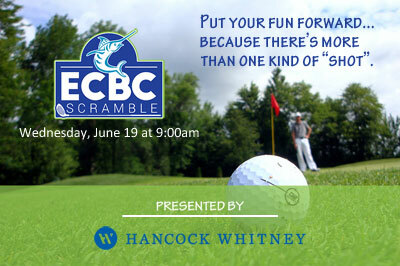 From our beginning in 2003, the ECBC has grown 102% in participation and a whopping 450% in cash awards. And we continue to grow every year. This page shows a summary of statistics from each year. Congratulations to our Tournament Champions! These are the men, women and teams who placed 1st in each division. The Fact Sheet is where to go if you want a one-page summary of the current event and tournament records. It was the blue-water version of David vs. Goliath. 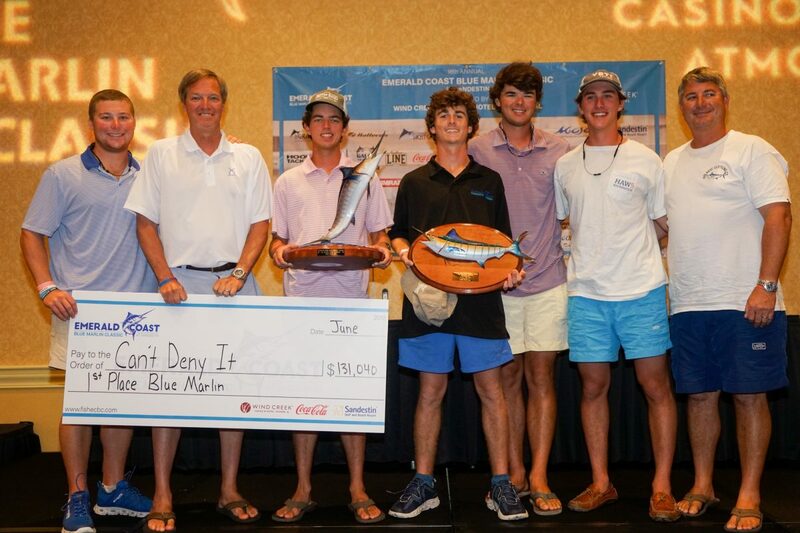 A group of high school buddies competing aboard a loaner boat topped 90 other professional teams by landing the largest blue marlin in the 2018 Emerald Coast Blue Marlin Classic. Angler Will Beard boated the 699.2-pound blue marlin after a nearly two-hour fight. Beard, of Fairhope, Alabama, and Todd Terreson, Mac Waller, Ritchie Prince and Pete VanLingen comprised the rest of the crew aboard Can’t Deny It, run by Capt. Bo Keough. Doug Terreson owns the 48-foot Viking based on Ono Island, Alabama. Beard was named top angler and the team is splitting $131,040 in prize money for its efforts. The backstory is even more incredible. Beard, Terreson and the rest of the team wanted to fish the Classic after graduating from high school this spring. Doug Terreson agreed to loan his boat with fuel and gear, provided the teenagers paid the $6,000 base entry fee. Todd Terreson would act as mate and veteran skipper Keough was a late addition. The team managed to scrap together the entry fee but couldn’t afford any of the optional jackpots that would have boosted their overall winnings considerably. Trolling a weed line 120 miles south of Destin, Can’t Deny It hooked the winning fish on a chugger lure, the only blue boated on a lure during the 2018 contest. The other four weighed fish were taken on live bait. The team also released another blue and a white marlin and boated qualifying tuna, dolphin and wahoo during the trip. The field of 91 boats, with an average size of nearly 60 feet, was vying for $2,040,200 in overall prize money. In addition to the tournament cash awards, teams could enter optional jackpots at various levels up to $10,000 in the blue marlin and release categories. This scenario contributed to the other historic news of the 2018 contest. Owner/angler Dana Foster, Capt. Myles Colley and the rest of the team aboard Born2Run, a 72 Viking based in Pensacola, Florida, was named the Top Release Team and Crew after releasing four blue marlin. 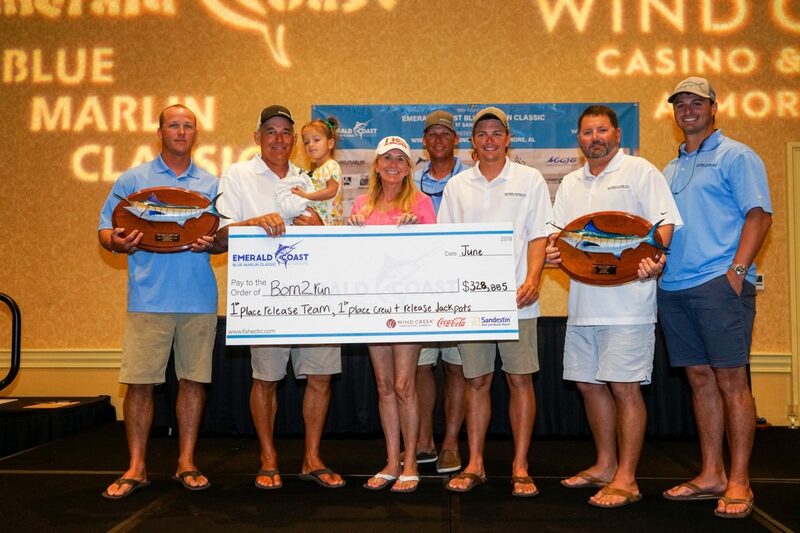 Born2Run won the biggest check of the tournament, $328,885, demonstrating the skill required in catching multiple billfish and the intrinsic value in releasing them unharmed. Born2Run’s payout is the largest ever in the Gulf of Mexico for an all-release score. 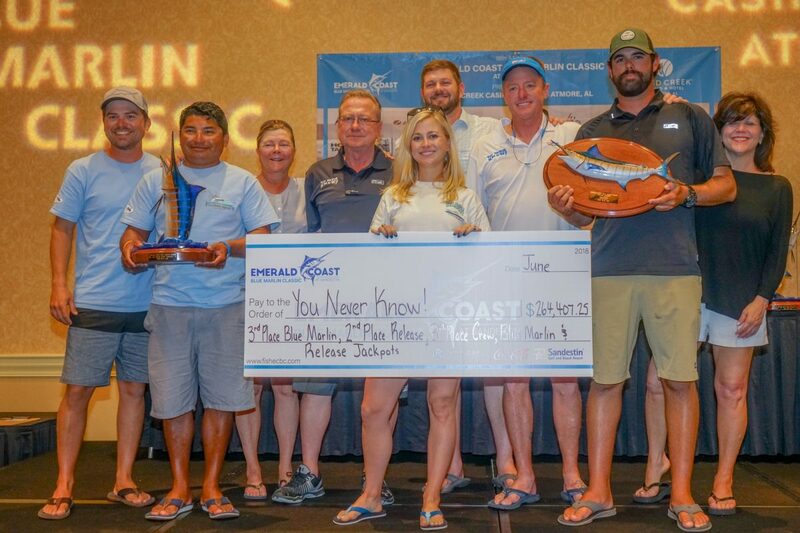 The other team members included mates Robert Bonifay and Tyler Maxwell, plus anglers Doug Franklin, Lisa Foster and Bryan Paul, all of Pensacola. The prize money included first place in every release division jackpot. Dana Foster was also awarded the Top Release Angler trophy. Reel Fire, owned by Chris Ferrara was a late arrival to the scales Saturday night. Angler Connor Ferrara whipped a 665.2-pound blue marlin to capture second-place honors. Capt. Chris Blanchet was at the helm of the dark blue 70-foot Viking convertible. 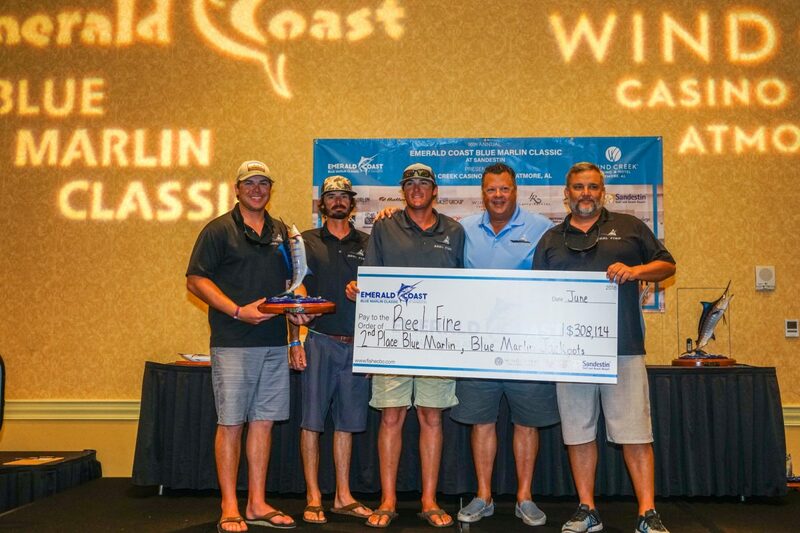 Reel Fire won $308,124 for their fish. Sydney Turner-Bankston, fishing aboard her father’s 72 F&S, You Never Know!, captured the third-largest blue marlin of the week at 640.8 pounds. Thomas Turner, Sydney, Capt. Joey Birbeck and the team earned a payout of $264,407 for that fish and two blue marlin releases. Sydney was named the Top Lady Angler for 2018 and You Never Know! was the second-place Release Team. Breathe Easy (Capt. Patrick Ivie and owner Matt McDonald) and angler Rick Olsen didn’t go home empty-handed after catching a 518-pound blue on a live tuna. The Orange Beach-based team won $201,375 in jackpots. Chef Emeril Lagasse, Capt. Brad Benton and the crew aboard Aldente, a 70 Viking based at the Baytowne Marina in Sandestin, weighed the fifth blue marlin of the tournament. Lagasse’s blue tipped the scales at 475.7 pounds. Nick Diblasio added the second-largest tuna at 168.6 pounds and Aldente won second in the Top Crew division. Past ECBC champion Done Deal, a 70 Viking owned by Jon Gonsoulin and run by Capt. Jason Buck, narrowly missed setting the new tournament record in the tuna category. Katie Gonsoulin whipped a 190.2-pound yellowfin, off the all-time mark by less than 1/2 pound. She also released two blues, good for third place in the Release Division, for an overall payout of $131,703. Angler Will Kaelin, fishing aboard Donny D III (Capt. CJ Pinney) landed the third-largest tuna at 168.4 pounds, which was worth $16,148. Wes Kennedy captured the largest dolphin at 42.9 pounds. Kennedy was fishing on Ultimate Lure (Capt. Dusty Parrish), to earn $68,540. Nick Jusko on Pullin’ Wire (Capt. Steven Gay) came in second in the dolphin division with a 39.8-pound bull, while Chad Wandrick on Soggy Dollar (Capt. BJ Teems) was third with a 39.1-pound fish. Seth McGonigal was the top wahoo angler at 63.8 pounds. McGonigal was fishing aboard Jubilee (Capt. Joe Morgan), earning the team $41,405. Tom Horstman was right behind with 60.1 pounds on BackDown2 with Capt. Gary Jarvis, while Neil Foster, owner and angler aboard Intense rounded out the division with a 56.4-pound wahoo. 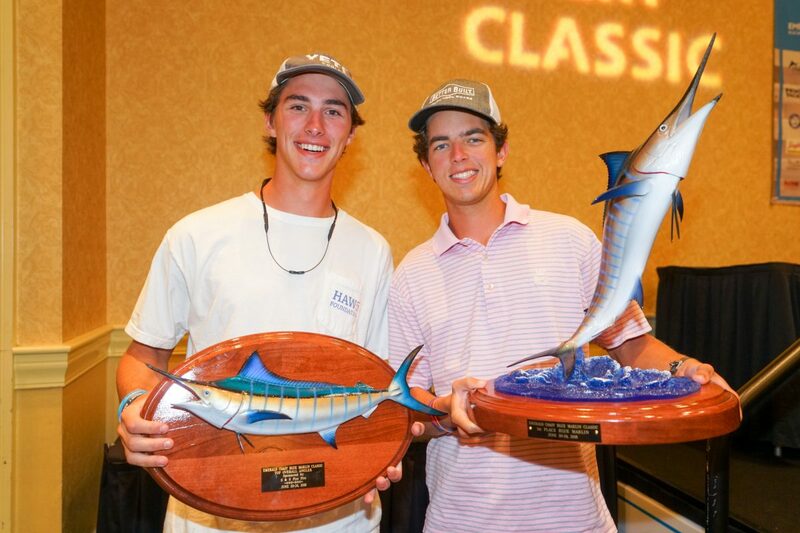 Brothers Houston and Clark Adams were named the Top Junior Anglers for billfish and gamefish, respectively. The two were competing aboard Gunnslinger, a 60 Hatteras run by Capt. PeeWee Moore. In addition to the five weighed blue marlin, another 43 were released, along with 12 white marlin and one sailfish. The 54 game fish boated included 22 dolphin, 20 yellowfin tuna, 11 wahoo and one big-eye tuna. Capt. 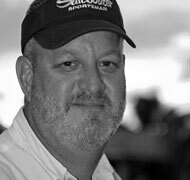 Dave Lear has been covering big-game fishing for more than two decades, first as the editor of Marlin magazine and later as an award-winning freelance writer and tournament correspondent. The former executive director of The Billfish Foundation was also the 51st angler to gain membership in the IGFA's exclusive Royal Billfish Slam Club by catching and releasing all nine species of billfish. Learn more about Dave at www.captaindavelear.com.